While off-target movement of pesticides is not a new problem, the growth regulator herbicides create a unique situation due to their ability to induce easily observed symptoms at very low doses. Large scale drift problems were experienced when the phenoxy herbicides were introduced in the 1950s. Primitive application equipment and highly volatile ester formulations were largely responsible for these problems. Advances in sprayers and formulations have greatly reduced, but not eliminated, off-target pesticide movement. Off-target injury is not limited to the growth regulator herbicides. In the first years after the introduction of Roundup Ready soybean it was not unusual to see 10 to 20 rows of corn damaged, even killed, by glyphosate drift. However, it was rare to see glyphosate injury across entire fields. Unfortunately, this is not what Iowa has experienced with the introduction of dicamba-resistant (Xtend) soybean. Dicamba poses a unique situation in that soybean are more sensitive to dicamba than nearly any other herbicide-plant combination (Figure 1). 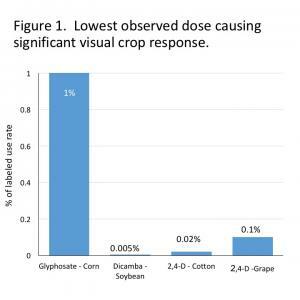 The risk is magnified since soybean is extensively planted in areas where dicamba is used. This article attempts to explain why the use of dicamba in dicamba-resistant soybean poses a different risk than the use of dicamba in corn, and why other states have experienced greater problems with off-target movement than Iowa. Why is dicamba use in dicamba-resistant soybean different than in corn? 1) Later application dates: The majority of dicamba applications in corn are made early in the growing season. Soybean often are not emerged, or at least are in early vegetative stages at this time. The majority of dicamba applications in dicamba-resistant soybean will be made as the crop approaches reproductive stages. Susceptible soybean varieties will be at greater risk with applications made to dicamba-resistant soybean than to corn since they are at a stage where yield impacts are more likely. Due to later application dates, temperatures will likely be higher during applications in dicamba-resistant soybean than in corn. While new dicamba formulations have reduced volatilization, they have not eliminated it. The higher the temperature, the greater the likelihood of vapor drift. 2) Dicamba use rates: The postemergence rate for dicamba is 0.5 lb/A in both corn and dicamba-resistant soybean. However, dicamba rates in corn are usually reduced significantly since it is often tank-mixed with other herbicides or due to crop injury concerns. Labels of products registered for use in dicamba-resistant soybean do not allow reduced rates. The use patterns of dicamba in soybean greatly increase injury risk compared to how it has been used in corn. While the magnitude of problems in Iowa during the 2017 growing season is much less than occurred in states south of Iowa, the number of injured fields is significant. My concern is that problems with off-target movement will increase in the future as use increases. Why have Arkansas, Missouri, and Tennessee had more off-target problems than the Cornbelt? There are several factors that likely contributed to the problems experienced in the mid-South. Problems experienced during the 2016 growing season were the result of illegal application of older dicamba formulations to dicamba-resistant soybean or cotton, as neither of the reduced-volatility dicamba formulations were registered for use until 2017. While there is evidence that non-registered formulations continued to be applied in 2017, problems have also been seen with the new products. The longer growing season in the mid-South results in an extended planting period compared to Iowa. In Arkansas, it requires 9 weeks to progress from 10% soybean planting to 90% (5-yr average; USDA/NASS). In Iowa, this is accomplished in 5 weeks. Prolonged planting would result in dicamba being applied over a longer period in states south of Iowa. Weed scientists in the region reported that many fields were exposed to dicamba drift two or three times, greatly increasing the severity of injury. The states with severe dicamba damage also have different cropping systems than Iowa. The acreage potentially planted to dicamba-resistant varieties (cotton, soybean) is much greater in the south than in Iowa (Table 1). In Dunklin County, MO, 80% of the acres could be planted to dicamba-resistant crops. In contrast, approximately a third of the row crop acres in typical Iowa counties could be planted to dicamba-resistant soybean. While corn acres could be treated with dicamba, they pose less of a risk as described earlier. Because of serious problems with Palmer amaranth, the percentage of dicamba-resistant crop acres treated with dicamba in the mid-South is much higher than in Iowa. Kevin Bradley, University of Missouri Extension weed scientist, estimates 65% of the soybean planted in the Missouri bootheel are dicamba-resistant varieties, and nearly all are sprayed with dicamba. I don’t know the percentage of soybean varieties that were dicamba-resistant in Iowa in 2017, nor the percentage of these soybean treated with dicamba. Informal discussions with farmers suggest less than 50% of the dicamba-resistant soybean were treated postemergence with dicamba. On a landscape basis, there would be much more dicamba applied per square mile in the mid-South than in Iowa, therefore greatly increasing the risk to sensitive plants. Table 1. Acres planted to agronomic crops. Other factors likely contributed to the widespread off-target injury experienced in the mid-South. The flat landscape in the Delta region probably allows greater movement of dicamba from treated fields than in Iowa. Temperatures also would tend to be higher in the mid-South during the dicamba application season. Agriculture is in a difficult position in determining how best to move forward regarding the expanded use of dicamba and the risks posed by this technology. There is no denying that new tools are needed to aid in weed management as problems with herbicide-resistant weeds continue to spread. I have tried to provide an objective evaluation of the risks associated with dicamba use on dicamba-resistant soybean, the benefits dicamba provides in terms of weed management are well-documented. Ag Industry, do we have a problem yet. Kevin Bradley.